A friction-meltable , water soluble base containing dispersed oxides for economical, neat preparation of oxide suspensions right on the lap. THE BATTSTIK™ Oxide Polish Charging Stick. The BATTSTIK™ was developed to reduce the mess and waste we all experienced with oxide slurries. This became even more important when the Darkside™ laps came into common acceptance, because everyone learned they require VERY LITTLE oxide polish! If too much oxide polish is used, it can pile up and cause scratching. 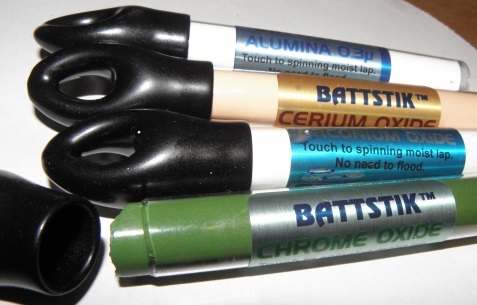 One benefit of the BATTSTIKs is they train people not to use too much oxides. Some forum writers are joking about leaving the leftover from their pound of cerium oxide to local faceting guilds in their wills. 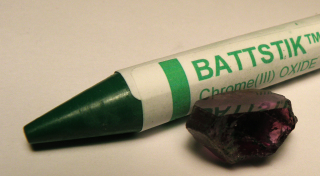 The BATTSTIK™ resembles a crayon, except it is water soluble. They should be stored in cool, dry places. A car trunk in Summer is not a good idea, as with any other “crayon”. This year we improved the packaging. For years they have been made with a paper label. But once in a while someone would leave them on a wet surface. There is nothing unusual about faceting and wet surfaces. Since a major feature of the product is the water soluble base, it does not take much imagination to see what a chrome oxide stick does. The new waterproof reclosable enclosures solved this and made for more pleasant handling. 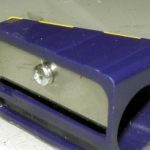 They can be sharpened with a knife, just as a carpenter’s pencil, or there is a nice crayon sharpener that works well with them, sold for “Woodie” crayons. There is also a “Lyra” sharpener, designed for graphite crayons, that works very well. We are making them available for $6. Touch the BATTSTIK™ to the lap, move outward to flowmelt the water soluble base, forming a thin uniform film on the lap. Turn on a SLOW water drip or light mist, creating a slurry film right on the lap. Reduces waste and mess! Offered in Alumina A, Chrome Oxide, Zirconium Oxide and Cerium Oxide. Travellers to Brazil have told me how popular Chromium Oxide is there. They cut a LOT of stones, so know what they are doing. But this is always accompanied by a comment..”..If you like a green shop, of course”. Chrome oxide even polishes the quartzes well, a little more aggressive than Cerium Oxide. Now we have a way of addressing the worst of the messiness of chrome oxide, and samples sent out to cutters have resulted in good comments for quartzes, garnets and tourmalines. Of course, the Cab and Jade cutters already know about this polish. The only negative report I had is that it seems to be slow on Spinel. Zirconia is highly specific for quartz, and is a faster and more aggressive polish for the quartzes, outperforming cerium oxide. It is not as versatile as other oxides, though, but quartz cutters have been getting very fast results that more than compensate for the material being so specialized. Recent postings by users have obtained stunning polishes on beryl and peridot, so zirconia is not as specialized as was first reported. SAFETY: The nontoxic BATTSTIK™ base is used in skin-contact formulations such as body paints, as well as shampoos and other NF Food, Drug and Cosmetic Approved products. Chromium Oxide is reported to be an eye irritant. I have not noticed, myself, but I wear glasses when I cut.